“My beloved servants, My beloved children, I, JESUS, bless ye today and give ye the Peace of My Sacred Heart. Glorify My Sacred Heart with a holy life as the Saints glorified Me. May your life be all pure, immaculate, replete of prayer, of good works so that My Sacred Heart be glorified in ye. Glorifying Me, adoring Me in Spirit and Truth signifies praising Me, serving Me with works, with holy attitudes. Therefore, repent of your bad habits, of your sins, of your evil inclinations and evil works. Live holily in My eyes, practicing good works of charity, of holiness, of love, of prayer and of purity, such that your works transform themselves in a true hymn of love to My Sacred Heart to glorify Me in the midst of all men. Glorify My Sacred Heart, making Me more known and loved. Make Me more known and loved by word and example, making all My children who still do not know Me, first know My Blessed Mother and then My Sacred Heart, since making My Mother known, ye will make Me more known and loved, because My Mother is the way, is the blessed bridge that leads all men into My Heart, that brings all men into My Sacred Heart and to the true love for Me. Making My Mother know, ye glorify My Name, because She and I are inseparable in LOVE as we were inseparable on the Cross, in the world's redemption. Work relentlessly to make Our Sacred Hearts known, making Our Messages known to the world, for only this way this wicked and perverse generation might have some hope of salvation. The world has become worse than at the time of the flood of Sodom and Gomorrah. Sins and more sins accumulate every day before Me and although My Arm had already punished this world many times for its crimes, hearts have not changed with the punishments. Hearts have not transformed. Soon after the last punishment, they began to offend Me again with the same sins as before and even worse. Therefore, I desire a deep conversion from all of ye, My children, antes before I end up launching My fire from Heaven above over the Earth until reducing it to a ball of ash. Repent of your sins from the bottom of your hearts. Cry for your sins and do not wait for tomorrow to convert, because you do not know if I will tolerate until tomorrow, if you wait for tomorrow. Convert yeselves now and turn your hearts to My Sacred Heart that for so many years awaits you with so much longing and so much desire of uniting itself with your hearts. Glorify My Sacred Heart, corresponding to My love, giving Me LOVE FOR LOVE. I have done so much for ye and ye have done so little for Me. I have given ye so much proof of My Love and ye have not given Me any proof. Finally give Me your heart now, corresponding to My Love, saying yes to the call that from the top of Heaven I make to ye in this Place already for 22 years with My Blessed Mother, with My Angels and My Saints. I have proven to ye along all these years My great Love Here, giving you grace upon grace, Mercy on Mercy, Message upon Message to raise ye of the bog of sins in which you are fallen, to lift ye up and elevate ye to Heaven, but ye, what have you done? What are you doing for Me? What works for Love are you presenting to Me to prove that you love Me? You fail in everything, My children. You fail so often in prayer, you fail in the practice of virtues; you fail to prove your love for Me even in suffering, because so many times you revolted against Me when I allowed a small cross. You are not able to prove your love with anything; your hands are empty! You are not even able to do the Prayer Groups, the Cenacles that for so long My Mother and I have asked ye to do to bring the Prayers from this Place, Our Messages to all Our children. How do you expect to be saved this way; In this laziness, spiritual aridity and lukewarmness in which ye find yeselves? This way, you will only get eternal fire, therefore I tell ye, My children: Convert yeselves because now My Sacred Heart still once is willing to forgive, is willing to wait for ye, is willing to have Mercy on ye. Cast sin away forever out of your lives, because sin takes you away from Me, cuts the link of grace that I have of your souls, deprives ye of My lights, rips the bond of My Sacred Heart with you and makes ye more each day slaves of Satan and evil. Convert yeseves! Return to My Sacred Heart and I promise that I will not repel ye. Come to Me through My Most Holy Mother, Joseph My faithful servant. Come to Me, beseeching Me through My Angels and My Saints and I promise ye that My Heart look at ye favorably. Continue to come Here in this Place so that I can continue your conversion. 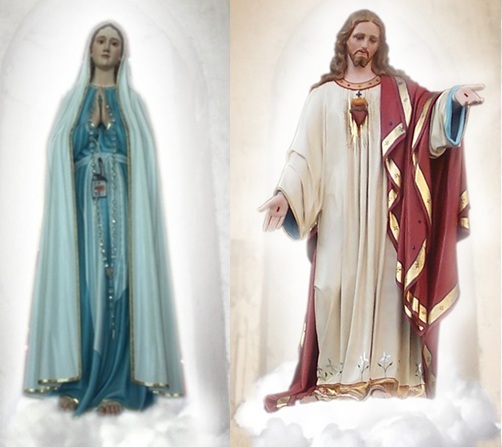 Continue to do all the Prayers that Here, Me, My Holy Mother and My Saints have asked ye, because through these prayers, My Sacred Heart will triumph in ye and will be more glorified by. To all at this time, I bless generously, from PARAY-LE-MONIAL, from TURIN where I appeared to My daughter Consolata Betrone and from JACAREÍ. Peace, My children. Peace to you Marcos, the most hardworking and dedicated of the servants of My Sacred Heart."